Please note, these are descriptions of comics that will ship a few months from now. If you don't want to have anything spoiled about any issue, please don't read any further on this page. All of this information is from Previews Magazine. • With Daredevil still missing, his shadow looms large over Hell’s Kitchen…and ordinary citizens are starting to feel his absence. • Detective Cole North may think he’s stopped Daredevil, but there are bigger problems coming his way! Advance solicited for September release! David Mazzucchelli's Daredevil: Born Again was released in the much-lauded Artist's Edition format in 2012. It soon became the best-selling Artist's Edition of all-time and was universally acclaimed. In 2013 the book received the prestigious Eisner Award for "Best Archival Project-Comic Books", as well as a Harvey Award the same year. It soon sold out and has been the single most requested AE book to date for IDW to reissue. So it is only fitting that IDW launch its new MARVEL series of ARTISAN EDITIONS with this award-winning classic! Just as the original release, David Mazzucchelli's Daredevil: Born Again Artisan Edition features the same scans-entirely from the original art-each painstakingly done by David Mazzucchelli himself to ensure the finest quality possible. If ever a book deserved to be in this format it is Daredevil Born Again. Frank Miller, at the peak of his powers, crafted a story that remains-in an extraordinary career-one of his finest pieces of writing. And David Mazzucchelli does a stellar tour de force job as his collaborator, providing a nuanced and pitch-perfect turn as artist. shattered life — and that includes returning to action as Daredevil! But years of trauma have taken their toll, and becoming the guardian of Hell’s Kitchen he once was won’t be easy. Mistakes will be made along the way — and this time, one might actually prove to be the end of him. Because when a criminal dies, and Daredevil takes the blame, Matt must go on the run in a desperate bid to clear his name! But even he can’t outrun judgment forever. And with DD’s absence from Hell’s Kitchen, the real devils can come out to play. Collecting DAREDEVIL (2019) #1-6.
soul of the world’s most dangerous woman! Collecting ELEKTRA: ASSASSIN #1-8. Asgard. Alfheim. Heven. Jotunheim. Muspelheim. Niffleheim. Nidavellir. Svartalfheim. Vanaheim. All of the Ten Realms have fallen to Malekith and his army, except one: Midgard. Home to Thor’s beloved humans. Home to heroes and gods alike. Now, at last, Midgard burns. All hell breaks loose in New York City as Malekith and his allies begin their invasion — and our greatest heroes watch as Earth falls! 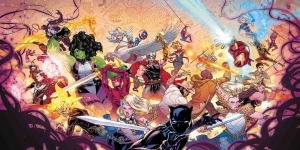 With Thor trapped in the land of the Frost Giants and Earth’s forces overwhelmed, Black Panther, Jane Foster and Doctor Strange undertake a desperate gamble. What can possibly stop Malekith and his army? 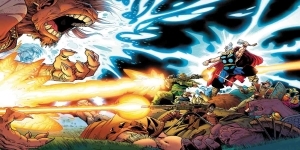 Spider-Man, Daredevil, Punisher, Ghost Rider, Blade, Hulk and more join the fray as Jason Aaron’s epic Thor saga explodes across the Marvel Universe in an event for the ages! 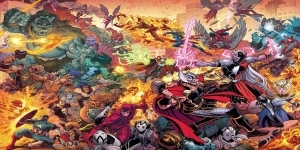 Collecting WAR OF THE REALMS #1-6 and WAR OF THE REALMS: OMEGA.